Add a crowning glory to your kitchen or outdoor entertaining space with Euro-Grille and Euro-Chef Rangehoods, an exclusive online offering by Mytopia. Rangehoods provide an elegant focal point for your cooking space all the while controlling and eliminating cooking odours, vapours, smoke and steam from swamping you and your guests. Perfect for patios and kitchens, Euro-Grille and Euro-Chef Rangehoods are sure to provide an elegant solution to a smoky problem. 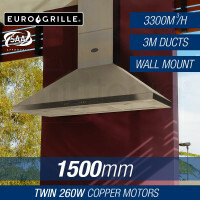 Euro-Grille 1500mm Wall Mount Rangehoods combine a sleek stainless steel modern finish with robust twin 260W full sealed copper motors to elevate any meal to a first-rate fine dining experience. Illuminate your food with the light from 5 LED recessed lamps. Designed for both indoor and outdoor use, the centrifugal fans can be adjusted from the soft-touch controls on the central digital display, ensuring ultra-quiet function that you’ll forget it’s even there. 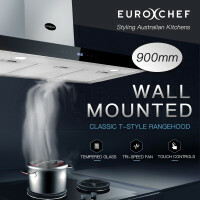 Available in Chimney and Curved Glass Island, and Wall Mounted variants, Euro-Chef Rangehoods are sure to impress the most discriminating of users. Kitchens are one of the most important parts of any home, and make sure your guests know it with a Euro-Chef Rangehood. Fusing a polished steel construction with top-of-the-line performance, your Euro-Chef Rangehood is a feast for the eyes. At the end of the day, cleanup is a breeze with the multi-layered aluminum filters, designed to trap all the grease and gunk. Realise your ultimate kitchen with Griddle Cooktops, Induction Cooktops , Ceramic Cooktops and Ovens, all available online on Mytopia. 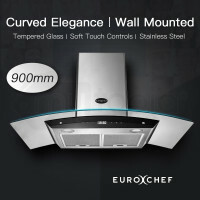 All Euro-Grille and Euro-Chef Rangehoods are covered by an extensive 12-month warranty for private household use. Mytopia guarantees fast and easy delivery anywhere, whether you’re in Sydney or in the Outback. 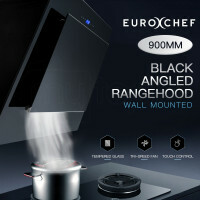 Buy a Euro-Grille and Euro-Chef Rangehood today and turn your kitchen into one for the ages.